Today, in addition to the pictures of the cats, I am going to tell you a little bit about each cat's personality. They are all SO different. Sherbert is super sweet and incredibly lovable. We call her "Sherbie, The Love Bug." She loves attention and meeting people, but she is a scaredy-cat. She is frightened of her own shadow! It just takes her a few minutes to assess the situation and get comfortable. 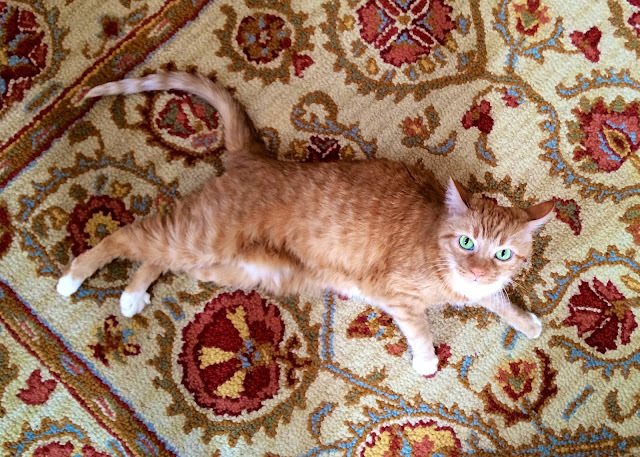 She loves to roll around on the rugs and "dance" for everyone. Her favorite part of the day is when she gets her can of wet food. We just have to keep Jack away while she eats. He is a food stealer. She hates to be held. She turns into the Tasmanian Devil when you try and pick her up! She prefers to sit on laps and snuggle. She is really calm and quiet until she wants something. It is amazing how something so small can get so loud - especially when she wants to be petted or is hungry! Her hobbies are sleeping in the bed and in front of the heater, playing with feathers, getting belly rubs and being rubbed backwards. Jack is the most easy-going and lovable cat I've ever had. Jack is a hoot. He is always up to something. Jack is "The Boss." He has to be the center of attention. He will just make himself the center of attention if he isn't. Jack loves to cuddle and be petted. He loves to get hugs. I have to hold him on my shoulder every morning. He wraps his arms around my neck and we hug. We went for a kitty hug world record the other day - we hugged for 22 minutes! He is my "huggie bear." I've had to build in kitty hugs to my morning routine. He also LOVES to eat. He prefers to steal the other cats food instead of having his own plate of food. Jack's hobbies include sunning on the patio, sleeping, pestering the other cats and eating. Fluffy adopted us about 5 years ago. She lived outside for several years. We brought her inside about 2 1/2 years ago. She is incredibly laid back and a super sweet girl, even though she looks mad in most of her pictures. She loves, loves, loves Chicken Legs. She follows him around the house. She loves to have her head scratched. She is a super picky eater. It drives me crazy! She can like one thing today and refuse to eat it tomorrow. Such a cat! Her hobbies include sleeping, bird watching, chasing her shadow, and dashing around the house at a moment's notice. As you can see, there is one trait all the cats have in common. Eating! They all look forward to dinner time. I feed them a can of wet food every night. They absolutely love it! I am always on the lookout for a good, healthy food for the cats. I want them to be around for a long time. Over the next few weeks I will be doing a taste test with SHEBA® cat food. All SHEBA® Entrées for Cats recipes are formulated without grains, corn, gluten or artificial flavors or preservatives. SHEBA® has three lines of food - Cuts in Gravy, Premium Patés, and GRAVY DESIRES™ entrées. I am actually really excited to let the cats try all these types of food. I am hoping to find a food that Fluffy finally loves (*fingers crossed*)! Have you tried any of the Sheba lines? Which one does your cat prefer? I love your Meow Mon. and you know I'm always lurking, but my Feedly featured the photo of Jack on the couch- had to come over to let you know it put a big grin on my face. Happy Monday. Love reading about their personalities. So cute!!! 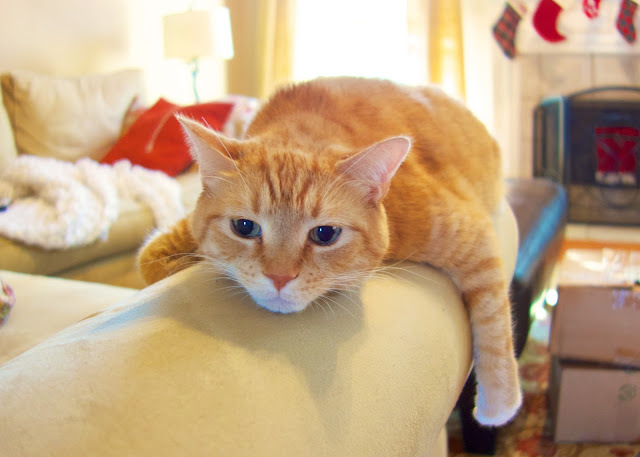 I love Meow Monday and I loved hearing more about your cats and their distinct personalities. I enjoyed hearing about each of the babies. figures Jack is the ham-bone of the operation. We have an almost-10-month-old kitten/cat. He loves to be petted......when he wants to be. You can tell when Stormy's tiring of the petting by how hard his tail is waving. If the tail is barely moving, or softly swaying then he is enjoying the attention; if his tail starts flipping, stop petting or you're about to be bitten. He's just as happy to lay on the couch next to you without being petted. But he's also a neck-snuggler - likes to be held right up under my chin, again, only when HE wants to be held. Stormy eats dry cat food, always has. We tried giving him wet cat food shortly after we got him, but he wouldn't have anything to do with it. I thought I would try again when he hits a year old, so I'll be very interested in your taste testing results. I just love your blog. I was receiving your E-mails and suddenly they stopped. I checked my junk mail and everything. dont know what happened. feedbunner says i am still subscribed. We just changed our chubby kitty over to wet because she was wolfing down the dry and puking it back up. She loves any of the Sheba seafood flavors. Then again, she isn't a picky eater. Our other cat (who doesn't have food issues) is finishing up our bag of dry and then she'll get changed over to wet too. Gidgette (aka chubby kitty) is the love bug of our house. She's always up on the couch to get scritched. Ivory (pure white Turkish Angora) wants petting on her terms. She's the challenging on. We have to pin her down to trim nails. And forget brushing. She gets shaved under sedation about three times a year. Loved reading about your kitties. I have four. They are all so different. Love your recipes too! 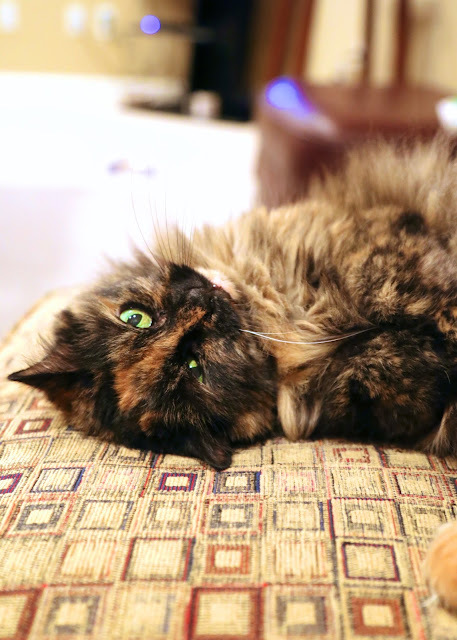 I love your cats, especially that tortie girl! I would recommend a high quality grain-free canned food for your guys. We currently feed Innova EVO venison, chicken & turkey, and sometimes duck. It's 95% meat and high protein, which cats need. Also, feeding mostly canned is so much healthier for them all the way around. In the past, we've fed Wellness grain-free in various flavors. By switching to mostly canned, you'll most likely see increased coat health and weight decrease. I have always enjoyed looking at your kitty pictures, but I was so glad to read about them and how much you love them! I also have 3 orange cats, I only chose to adopt one of them, the other 2 just found their way into our lives. I agree with Stephanie above about the grain free food. I fed my cats a light dry food (diet) and I thought I was feeding them good food since that is what all the Vets stocked. One of my cats developed diabetes at age 7 and he wasn't really my overweight cat. I have since switched all 3 to Wellness Core wet food and they have all lost weight and my diabetic cat is managing his diabetes very well on this food. Here is a pic of 2 of my guys (first pic on page), the diabetic cat is on the right. http://holycuteness.com/2011/12/25/cats-celeberating-catmas/ Thank you for sharing!